Serve this dish over brown or white rice. Directions: Combine the first 9 ingredients of the garlic sauce in a sauce pan. Bring this mixture to a boil, reduce the heat and simmer for 5 minutes. Set aside. In a large skillet or wok, heat oil and water together over a high heat. When pan is hot, start by adding carrots and broccoli, stirring constantly for about 2 minutes. Add another tablespoon or two of water if pan is dry. Next add mushrooms, bok choy, cucumbers and green onions and stir constantly for another 2-3 minutes. Vegetables should be tender but still crisp. Stir in baby corn and water chestnuts...remove from heat immediately. Combine arrowroot with water, mix thoroughly. Bring the garlic sauce back to a boil, add arrowroot mixture to thicken sauce. Stir for about a minute and remove from the heat. 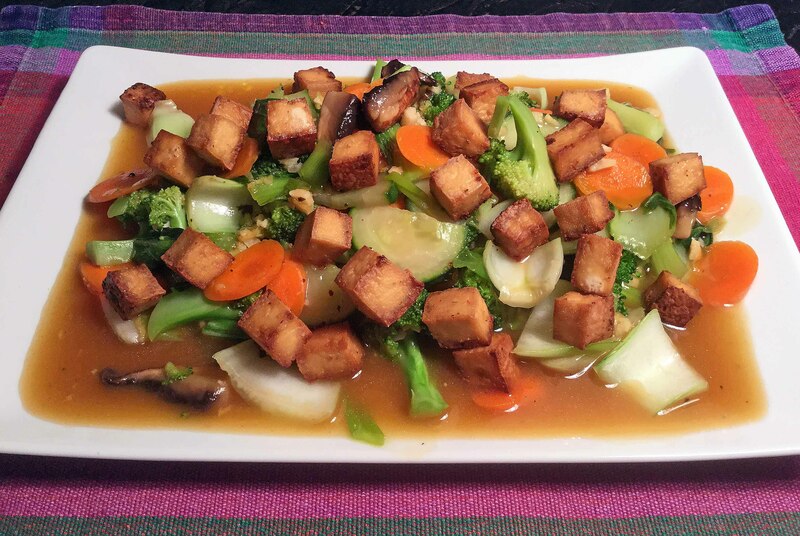 Pour the sauce over the stir fry vegetables, gently mix, and serve vegetables immediately with rice. Optional: top the vegetables with oven roasted tofu and your serve with your favorite hot sauce.